As you may know from this previous post, my husband and I went to Belize in December for a week. This post is about the to-ing and fro-ing. If you’re like me, you like to plan things and know what is going to happen when. As we were considering our plan to go from Cozumel, Mexico to Ambergris Caye, Belize, a lot of people said “don’t worry, it’s easy” but couldn’t provide any specifics other than “a taxi will take you there.” Well, not likely a taxi from Cozumel (an island) will go to Ambergris (another island) and so off to the interwebs I went, looking for info. Turns out there are lots of blog posts, most from circa 2005 or ’06, but not a lot of concrete schedules or things, which a control freak detail oriented person such as myself was looking for. So here is my own blog post, circa 2010. There were going to be a few legs to this journey: Cozumel to the Playa del Carmen (easy ferry trip), PDC to Chetumal (on the bus), Chetumal to somewhere in Belize, and then somewhere in Belize to Ambergris Caye. The first two parts are easy; the ferry from Coz to the mainland runs several times each day, the only trick is catching the ferry that will get you to the next leg on time. The second leg is also fairly straightforward. The easiest way to get correct information about the bus schedule is to go to the bus terminal. Here in Cozumel, we have an ADO (one of the bigger bus companies) ticket office at the ferry terminal, so I went there and got the schedule. Turns out buses go from PDC to Chetumal about 12 times each day, with different prices and times depending on how fancy the bus is (does it have a bathroom?) and how often it stops along the way. Also note that there are two bus terminals in PDC; the bus we took to Chetumal leaves from the terminal in town, not the terminal near the ferry. The third leg, the Chetumal to “somewhere in Belize” was the one that posed the greatest challenge. I had determined that there were flights from Corozal, Belize to Ambergris Caye several times each day on two different airlines, and so that seemed like a good way to go. How to get from Chetumal to the Corozal airport was not so cut and dried. There are two “transfer companies” operating in Belize, both of which advertise that they can meet you at the bus in Chetumal, help you with the border crossing (both sides) and get you to the airport in Corozal, for a fee. Get Transfers charges $40 for this, and Menzies Tours charges $45. Both companies include pick up in Chetumal (Get Transfers picks up at a Burger King near the bus), assistance with the two border crossings (out of Mexico and into Belize) and then transportation to the airport (I’m going to start calling it what it is: a tiny airstrip) in Corozal. I hadn’t found Get Transfers to be very responsive to my questions and so on the advice of a twitter contact, I got in touch with Menzies Tours and advised that I’d like to use their service. The last I heard from them was that they needed payment in advance, and they were preparing payment forms and would get back to me. Three subsequent emails from me saying “where are the forms, are you coming to pick us up?” went unanswered, and so we arrived in Chetumal unsure of what would happen next. What happened was that as we exited the bus in Chetumal, there was a fellow standing there saying “Belize? That bus there.” When asked what his bus to Belize cost, his answer of “60 pesos” sold us. We did have 60 pesos (about $5) and nothing but time, so decided to go for the adventure. The bus was an ancient school bus, but it worked. Turns out the bus driver assisted with the border crossing out of Mexico then dropped us all off at the Customs and Immigration house into Belize and waited for us on the other side. Like most border crossings, it was just a lot of standing in a line, nothing that really required “assistance.” The bus then drove the fifteen minutes into Corozal, dropped us at the bus terminal and we caught a taxi ($4) to the airstrip. We then got on the tiniest plane ever, ($45) and were in Ambergris in time for a nice dinner. On the way back, we took a taxi from the airstrip in Corozal to the bus station. Get Transfers operates there, outside of the taxi union. The trip costs a flat fee of $30 USD, and we took the union taxi (much less pushy than the Get Transfers drivers). The taxi driver did the same as the bus driver had, dropping us where we needed to be for the border crossings and waiting on the other side. 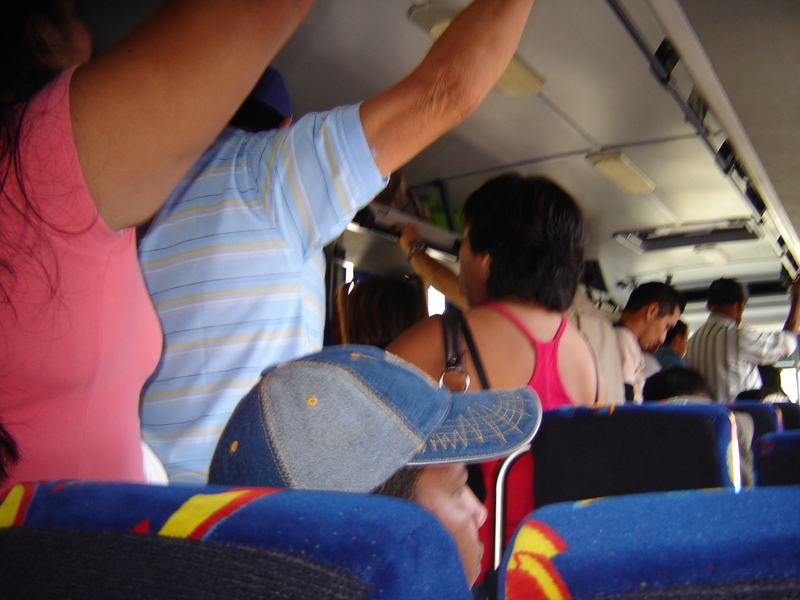 We missed the “premier” bus to Chetumal and ended up on what we called the “chicken bus” – a little cheaper (I think 150 pesos) but WAY more crowded, way more stops and no bathroom. Still, we got to Playa del Carmen in time to go to Sam’s Club and stock up on wine before we headed back to the island. Bottom line, travel is easy, cheap and safe. The people are willing to help you as needed. If you need a “travel company” then go ahead and use one, but don’t necessarily expect the level of service you’d expect at home. You’ll pay extra for the peace of mind of having someone else take care of everything, but they may not actually take care of anything, leaving you money out with no benefit. the chicken bus. spend the extra money to not go on this one! ~ by ktatkins on February 13, 2010. Kari, great to hear about your adventure, as we’re planning the same trip in Feb 2011!! After 2 weeks in Ambergris Caye, we need to get to Playa del Carmen from Belize City. We’ve been fretting about it a bit, so good to know it’ll be no big deal! 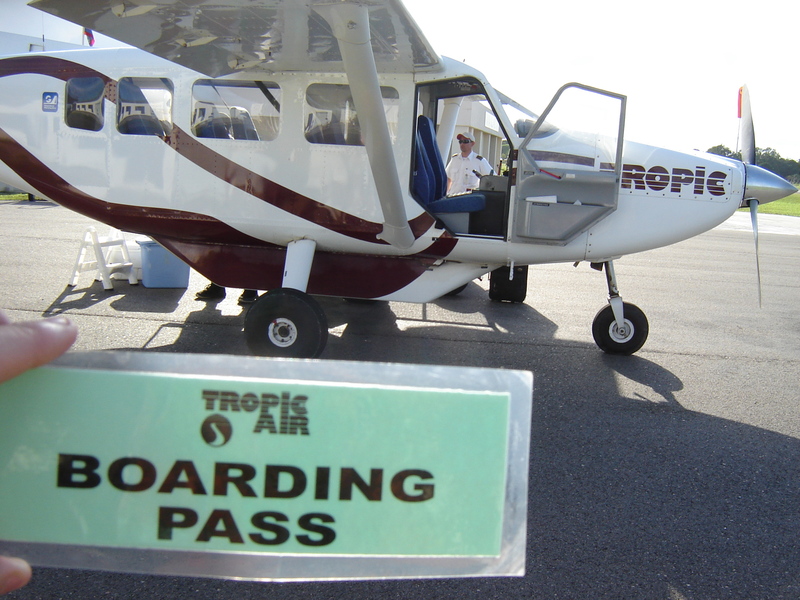 Our hotel on Ambergris provides flights to Belize City. Your flight between Corozol and Ambergris was pretty cheap. Should we go that route and avoid Belize City altogether? Unless you have another reason to go to Belize City, I’d say skip it. I’d check with your hotel in Ambergris to see if they’d just switch your flight to Corozal; many of the ones I looked into would do either. I’ll be curious to see how you like the diving there; will you be stopping in to say hello on your way past? Let me know! We will try this route in the next week. Flying into cancun and headed into belize. I am curious whether its easier to take the 1.5 hour water taxi between Chetumal and San pedro. Its $45 U.S. and I think I miss a step! Hi Maureen, no we didn’t take the water taxi. We tried looking into it before we went, but it was difficult to find information on departure times. Rumour at the time was it only ran a couple of days a week, but I don’t know what it is doing now. I came across your blog and wanted to ask you a couple of questions. I will be making a trip from Kansas City to Cancun Intl Airport, and then going on to Tulum, Mexico for a few days. Then I want to go from Tulum to Chetumal and on to Corozal, Belize. Can you provide me any advise or recommendations on making the trip from Chetumal to Corozal as pain free as possible? I am considering renting a car at Cancun airport, but not sure I can drive it into Belize. Any recommendation on that idea? Also, any idea the distance from Cancun or Tulum to Chetumal? I understand it is only about 15-30 minutes from Chetumal to Corozal. Is that correct? Lastly is Chetumal a good city to live in. I was told it has many of the conveniences of the West. Such as a Sam’s club and other western style stores and restaurants. Any feedback on any of these issues is much appreciated. Thanks for the note, Jim; I sent you an email. Could you tell me how this trip went..I am considering this next year.. I, too, am doing a similar trip in January. At the moment, I’m thinking we’ll take a Mexican taxi to the border, cross on foot and pick up a Belizean taxi to go on to the Corozal airstrip. Considering that we will have all our luggage for 5 weeks in Belize, do you think this is doable? Is the distance between the two immigration points walkable? 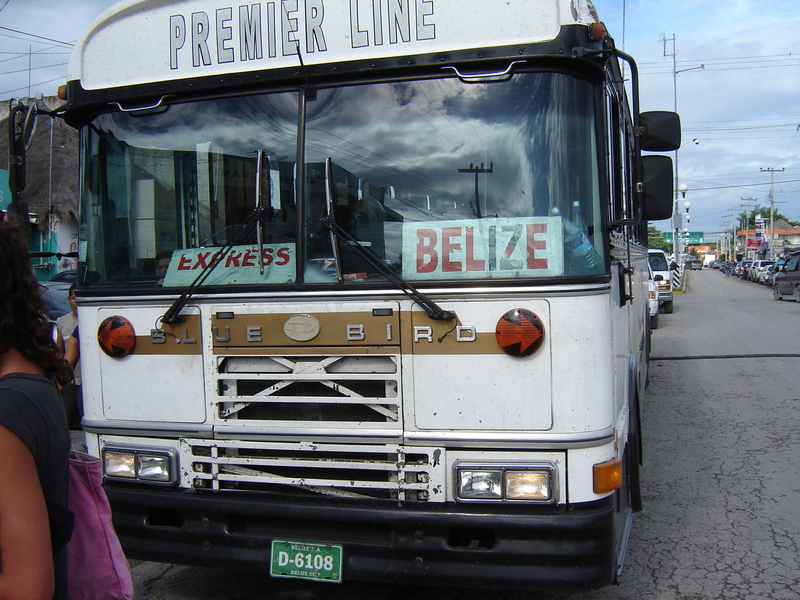 Did you notice if there were taxis available after Belize customs? Thanking you in advance for any help you can offer. That does sound possible… Where are you starting your taxi journey in Mexico? When we came back, we had our Belizean taxi bring us to the bus in Chetumal, so I imagine you could have one pick you up there, or have your mexican taxi drop you at the Corozal airstrip. The checkpoints are inside a “no man’s land.” I don’t recall exactly how far apart they were, but not too far. And if I remember, there were taxis everywhere. We are overnighting in Chetumal at Hotel Noor…it’s on Chetumal Bay so quite a ways from the border. I know that the Belizean taxis can cross north to Mexico but I don’t know if the same is true in reverse i.e. Mexican taxis can travel in Belize. However, if they can, then that would be the most convenient solution for sure. I’ll look into it. Your blog and subsequent reply to my questions have been very helpful. Thanks again! I am trying to get information about the cost of entering Belize from Chetumal. I have heard it’s around $50 USD if you go by bus and if you go by water taxi that they keep your visa until you come back and the cost is cheaper (this sounds absurd). Reading your blog it does not mention anywhere the cost to enter or leave Belize. It sounds like it ‘s easy to take a taxi from Chetumal to Belize border, cross on foot, and pick up another taxi to get you to the water taxi that will take me to San Pedro. I’m doing my best to look this information up on line, but have not had any success, so I’m hoping you might be able to shed some light here. I also tried to do a lot of research online in advance of our trip, with little luck. The reality is it is much simpler than the internet makes it out to be! Have a great trip. I wanted to post that I did receive information by email from San Pedro water taxi. They say they leave Chetumal for a 90 minute ride to San Pedro @ 3pm every afternoon and leave San Pedro for Chetumal every morning @ 0815, the cost is $35 USD one way and $60 USD roundtrip. They say there is parking nearby to leave our rental car for 2 days in Chetumal @ 25 pesos per night. We can make reservations ahead of time for the water taxi. It sounds good to us….we’ll try it. I too, am trying to gather info for the same trip from Chetumal to Belize. We have a condo in Cozumel and are familiar with travel to Chetumal. We thought we could rent a car in Playa del Carmen and drive to Chetumal to allow for sight seeing on the way there and back. We are hoping to get an express water taxi from Chetumal to San Pedro and back. I am trying to email the water taxis to get the dates & times they travel and hopefully make reservations. Our question is: where can you safely leave a rental car in Chetumal for a couple of days while we’re in Belize? Does anyone know if safe parking is offered anywhere? I’m travelling through Central America next year and I too am a “detail orientated” person. So it goes without saying that I have been a bit anxious about our Mexico to Belize leg of our trip. More so because I am travelling with my husband and four small children. Bearing in mind the kids are 8 years old and under, would you recommend the same bus trip from Chetumal to Corozal? My children are fairly well travelled but am concerned that even for them our best bet would go via a private transfer firm. Four kids under the age of 8? You are a trouper! What a wonderful experience for them, and for you as a family. I have to say that yes, if that was the situation I was in, a private transfer would be the way I’d do that leg… it wasn’t too expensive, and we would have done that had we ever heard back from the transfer company. In fairness, perhaps they needed more notice or something; I am not sure where the communication breakdown was with them. That bus ride, while short, was a bit hair-raising! And if you’re traveling by bus in other parts of Mexico, I’d definitely recommend the “expensive” bus – where you have an assigned seat, as opposed to the free-for-all that the cheapest ticket can provide. Have a great trip! Do you blog? I’d love to read about your adventures. Thanks for your reply. I’ll definitely go the private transfer route. I’m not travelling till next May so that’ll give me plenty of time to follow it up. I’d never thought to keep a blog (although I do a diary) but having read your blog and seeing how helpful it has been I’m definitely going to do one for our future travels. I’ll keep in mind to put plenty of details and recommendations especially tailored to help people travelling with children.